Check if any of the eggs has cracks in it and get rid of those with cracks. 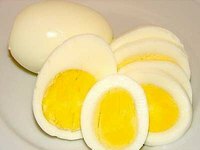 You'll end up with a less than perfect boiled egg if you use a cracked one. Place them carefully in the pot and add salt or vinegar to the water to close the cracks quickly in case it happens because of the heat. Add salt to make the eggs easier to peel once it is already cooled in running water. You could also add alkaline water to make the peeling a lot easier. After boiling, you could either remove the pan from the stove and cover it or let it cook for another four to seven minutes. The duration of cooking depends on how you want the egg's yolk to be. Cooking it longer would make it moist, otherwise, the yolk would be dry. Never forget to put the pot's cover back once you have taken away the pot from the stove. This is to get just the right temperature you need to cook the eggs just the way you like it. Leave the eggs in the pot for fifteen minutes then let it cool under running water or on a bowl with ice.